Audi Q5 Pros and Cons | Page 1 of 1 | Why Not This Car? What drives people to buy (or not buy) a certain car? TrueDelta's members share Audi Q5 pros and cons based on their real-world driving experiences. Absolutely love this car, super reliable, and great driving characteristics. This car is just what we were searching for. Big on the inside and small on the outside. Has lots of power but gets good gas mileage. Is fun to drive but rides smoothly on bumpy streets. Has really comfortable seats for 4 adults. 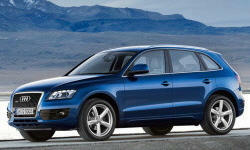 Audi Q5 TDI 3.0L: Too good to be true? I have calculated my gas using the onboard computer a few different times in mixed driving and am getting a consistent 25/26 mpg. That&#039;s without hard acceleration or driving above 70 MPH on the highway. but comparable mpg as we got on the 2.0 ! The Q5 looks and feels well built. The interior is well laid out and is very elegant.